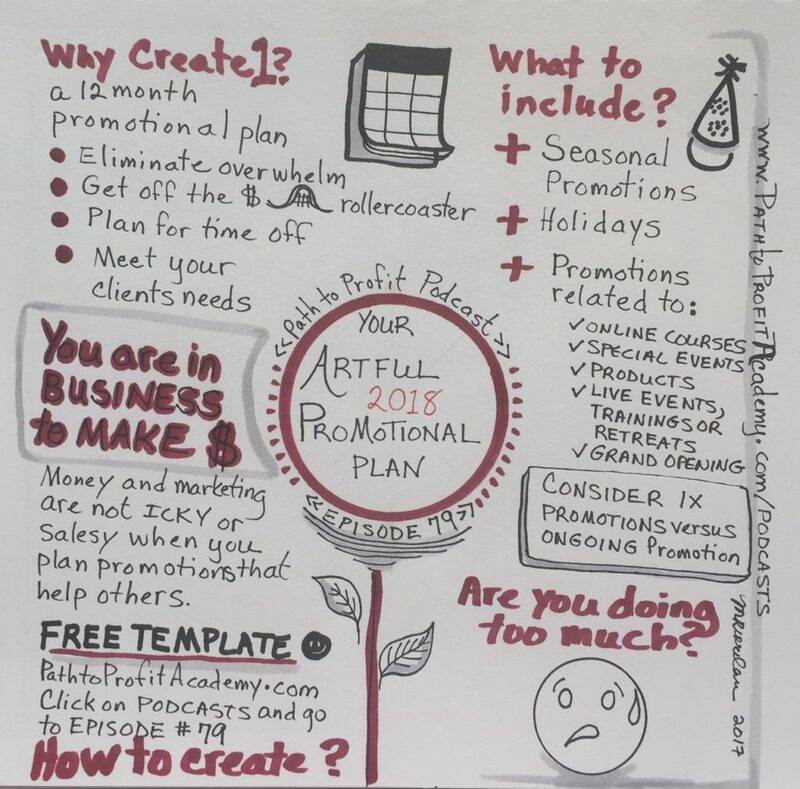 In our second episode of January’s Business Planning theme, we dive deep into why you should plan out a promotional calendar, what it is, and how to set it up. If you missed last week make sure you go back and listen to Episode 78 where we talk about our favorite business planning tools. In many cases, we find that creative entrepreneurs struggle mightily with promoting themselves: especially those that come from a place of trying to heal others. They see promotion as icky and salesy. But it isn’t: not only is it an integral part of a business, it’s also our best opportunity to help the right people find us so that we can provide them with the services they need. What is a promotional calendar? It’s you sitting down and plotting out a year’s worth of promotions on a big wall calendar, e.g. I’m going run Facebook ads to promote my live event in the 3 months prior to September 9th, I’m going to put together a new 10 minute talk and start giving that at networking events starting in August. Why create one? To have more consistent income throughout the year, to eliminate overwhelm and avoid playing catchup at the last minute, to show yourself where you need to spend time creating promotions, and to plan your own time off. You want to avoid having gaps in your year! What to include? Any live events you do including meetups, course launches, networking events, seasonal holidays, Black Friday sales, school year, and so on. How do you do it? Get a 12-month calendar and mark all of the important holidays and other impactful days. Get sticky notes and brain dump the different things you want to promote and place them on the calendar. Look for gaps and decide whether you need to fill them (to create more consistent income) or leave them (to give yourself a break!). Brad Dobson: … second in the … Yeah. Our second in the series of business planning specifics. Today, we really want to talk to you about setting up your promotions for the whole year, your promotional calendar. Minette Riordan: Which leads us right into our quote for this week, which is from P.T. Barnum. It’s a famous quote, been around a really long time, which is that, “Without promotion, something terrible happens. Nothing.” One of the places we want to begin this conversation about why have a promotional calendar is because if you’re in business, I assume that you’re in business to make money, and yet what we find with our creatives is that so often they get stuck thinking that promotion and marketing are icky, and it feels yucky, and you feel like a used car salesman. Minette Riordan: … on the website. Brad Dobson: I couldn’t pull the trigger on it. It was kind of weird. That’s for somebody that, I don’t think of myself with a lot of those issues. We’ve had other clients who you would definitely think of as people that would struggle with that, and they did, sorely. Minette Riordan: And still do. Some really still feel that challenge. Minette Riordan: I don’t know if that’s a nice way to say it either. Minette Riordan: I think I am one of those healer types. Brad Dobson: Yeah. Brought into the world to help and come from that place. It’s definitely not second nature for them to promote. Minette Riordan: … birthday. It’s my 17th year as an entrepreneur. How crazy is that? Brad Dobson: You’re a teenager now. Minette Riordan: … of being in business for myself. I had the same thought. I’m like, “What does it mean to be 17 as a business owner,” and maybe I could have some of that energy back of being 17. The thing that I’ve had to learn many times over is that when I’m crystal clear about what it is that I’m selling, why I’m selling it, and how it will help people, it takes a lot of the icky feeling away. What we want to talk to you today is about why you need a promotional calendar and what it’ll do for you and how it will take the icky feeling away. Brad Dobson: And even what it is. Minette Riordan: And even what it is, and then some practical, fun, super-creative tips on how to make it happen. This is not a boring spreadsheet process. You hopefully by now know us better. If you’re listening to us for the first time or watching this on YouTube for the first time, you can see all the art behind you that my son had a lot of fun hanging on the wall there, you’ll know that we do everything with crayons and markers, because when you add color and playfulness to your marketing strategy and planning, it takes a little bit of the fear and ick factor away from it. Minette Riordan: What is a promotional planner calendar thingy? Minette Riordan: Specifically, today we’re looking at over the whole 12 months. Brad Dobson: Yeah, and we like to get a higher-level view of our promotions for the next 12 months, and in fact we did that late in the last quarter for 2018. Specifically, we’re doing themes, so we started out with goal setting in December and business planning in January and so on and so forth, because that allows us to focus our content better and provide better for our listeners and our readers. But you might parse it up differently. Perhaps you’re a retail salesperson, Etsy store, or actually a brick-and-mortar store for your creative stuff, and you know that your promotions have to go around seasonal or all the traditional promotional times. It’s different for everybody. Coaches might find that they’re the same as gyms. Right? Minette Riordan: Yeah, and you can, excuse me, you can check out our show notes. I’m going to put a photo of our wall calendar in there, and so they can see how we actually do this. 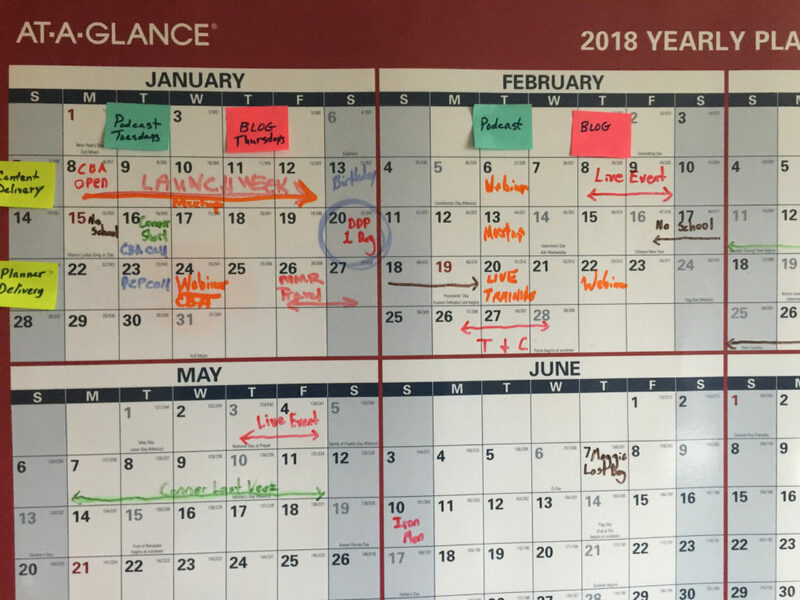 We have a 12-month write-on wall calendar so that we can move things around, but I want to back up just a little bit about why the emotional reasons and sort of practical reasons around why have a promotional plan for the year? These were lessons that I, sadly, think we’ve been learning the hard way. 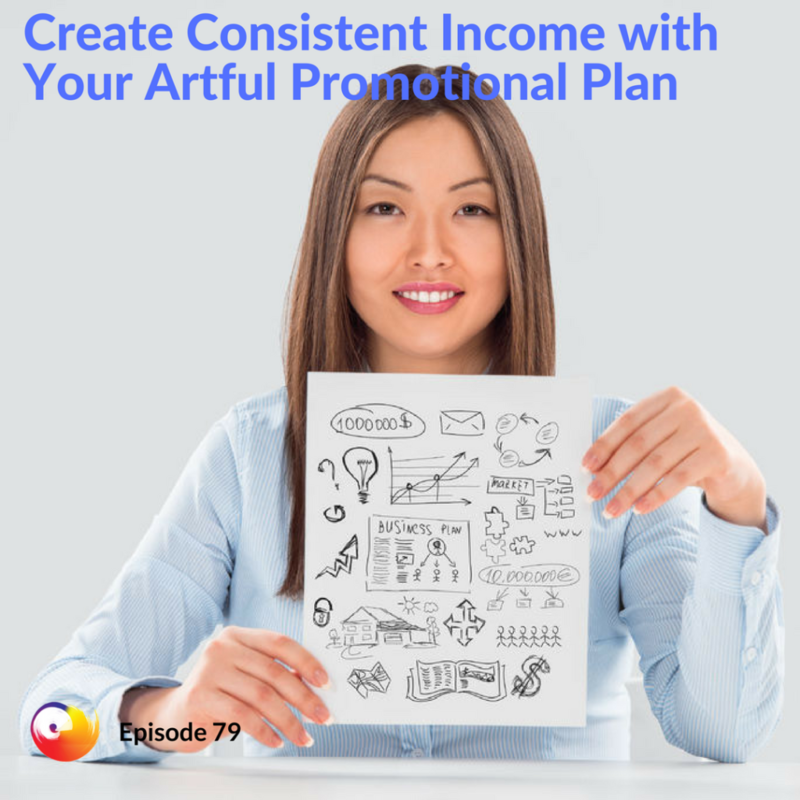 Like we’ve had promotional plans and promotional calendars usually a quarter at a time, and in fact, in Episode 80 we’re going to get really specific with why we think you should work in a quarterly cadence for your business, but the reason to have a promotional plan is, one is tied directly to your income. If you’re not creating consistent promotions, you’re not making money, but it also will help you to eliminate overwhelm, stop you from going insane or driving your spouse insane. It’ll keep you from overdoing it. Sorry, having some froggies in my throats. Brad Dobson: That’s all right. Minette Riordan: That final thing is, and this is something Brad asked for very specifically, and it was a big learning for me personally, was that you need to plan breaks following your promotions. Brad Dobson: Yeah, exactly. You figure out 14 days before or 30 days before. Minette Riordan: Or two days before. Brad Dobson: Yeah, and you cobble together something, a few emails, and they go out, and maybe the links are broken, or whatever, and you never really got the traction that you needed to pull things in. Plus, you spend a lot of time with churn that way, whether it’s you on your own or you and your team, there’s interruptions and just a lot of wasted time that way. That’s one way it could go. The other way it could go is, you gracefully approach a promotion. You see it. You know that it’s coming a couple months ahead. You, your team, whoever it is is able to produce the things that you need to, whether that’s emails, landing pages, whether that’s simply you getting out to more networking events, you having practiced your spiel related to the thing you’re promoting. Maybe you go to the Chamber of Commerce, and you have a slightly different 22nd pitch, because you know that that’s what you’re promoting at this point, and you’ve practiced it, and you know it’s coming. It’s not something that you wing and you get all red-faced about. Minette Riordan: Yeah, and there’s a word in there that you keep saying that I think is so important to sort of pluck that out and shine a little more light on it, and it’s “practice.” I think one of our big themes for 2018 in our business is mastery, rather than constantly creating new things, getting a lot better at the things that we already do well. Part of the reason that we’re looking at this promotional calendar is so that we don’t make ourselves crazy and that we do a good job. I want to give a really specific example. We’re launching a brand new membership program this week, actually. We’re pretty excited about it. Minette Riordan: … right? To plan a promotion. We have had this scheduled … In fact, we pushed the schedule back. We were going to launch it in December. Brad Dobson: You’re making me think I need to work on the promotion for your birthday. Brad Dobson: Like International Donut Day. Minette Riordan: … Ice Cream Day. Yes. Bacon Day. Minette Riordan: Bacon Day. Every day in our house, I think, is Bacon Day. Brad Dobson: No offense, vegans. Minette Riordan: Yes. No offense to vegans. Maybe it’s National Hummus Day. Minette Riordan: Right? Which we also eat almost daily in our house, but it’s just that noticing, what are the seasonal promotions that you can capitalize in your business? What specific business promotions do you need to plan for that are tied to live events that you’re hosting, launches of online programs that you’re offering, releases of maybe brand new programs or releases of programs that maybe you only release or open the doors to once a year, and really looking at what are ongoing promotions versus one-off promotions. For us, a lot of people have come to our email list through our mentor, maker, maverick archetype quiz. That’s an ongoing promotion. It has an ongoing Facebook ad, ongoing email sequences, ongoing offers, as opposed to what we’re launching with the Creative Business Accelerator, which this week is a one-time promotion. There will be other ways to join that group that’ll have ongoing promotion connected to it as well, but it’s very different than when we host a three-day workshop, and that has its whole own promotion. The whole point of looking at it from an annual perspective is to make sure, one, you’re not doing too much, and two, to make sure you’re doing enough. It is a fine balance, but realistically, but for any type of launch or promotion, you’re going to need six to eight weeks to really do a good job. Brad Dobson: Yeah. Yeah, probably. Minette Riordan: From the creative part to the promotional part, to the actual getting the word out. Even if you’re only doing maybe a three-day online promotion of something, it can take six weeks to create that. All the promises that you hear online of get rich quick, make a million dollars overnight, right, what they don’t tell you is how much work goes into all of this before an actual launch, so looking and planning ahead. I know, my sweet creatives, how hard this can be to do. It can be hard for me to do it, although I love the planning, and it was so wonderful yesterday to sit down at my desk, to log into our planning software that we use called Jira, and to go, “Okay, these are the next two tasks that need to happen in order to move this promotion forward.” Falling in love with planning is a big part of what we want for you to feel in this first month of 2018. Brad Dobson: Yeah, one of those things. Brad Dobson: Yeah. We’ll plan a promotion and then turn around and have another promotion the next week that we just forgot about or we didn’t plan out. Look at that natural flow, and think about what you need after you put all this effort to setting up a promotion and getting it off the ground so that you have some space to just kind of kick back and let your brain relax a little bit. Minette Riordan: Yeah, and the other thing is, you may have an idea of what you want to launch this year, and you may be thinking you need to launch it all right now or in the first quarter of the year, or you may have plans to launch something now and something in the fall. When you put it on a 12-month calendar, you actually also can see the gaps, so in addition to making sure that you’re not overdoing it, you have to make sure you’re not underdoing it, even if your goal is simply to get five new clients a month or to sell two large pieces of art a month. Right? I have friends who are sculptors or friends who are musicians who, they may not be looking for daily sales. They may be looking for fewer, larger sales. But being crystal clear about what are the promotional activities needed to drive five clients, to drive the sale of one sculpture? Does that mean going to local art fairs at least once a month or several times a month, or during the season of sort of March, April and May is like art festival season, and making sure you’re hitting as many of those in your community as you can? Not only are you looking at what are you promoting, but what are the specific activities that need to happen to drive that process? If you’re looking at your calendar, and actually the art festival’s a great example, so March, April and May tend to be festival season. Right? If you’re doing a lot of festivals March, April and May, but you really don’t have any other promotional opportunities the rest of the year, there’s a big gap, like a nine-month gap, so what are you doing the rest of the year to grow your business? You can’t guarantee that all of your sales for a whole year are going to come from a 90-day period, so this is where it’s so important to look at the opportunities, to look at the gaps, and to not overdo it. Brad Dobson: … that’ll give you a little bump at that time that you haven’t had in the past just because you weren’t sure what to do, or because you just did exactly the same net marketing that you had done previously. Things to think about. Minette Riordan: Then the last piece I want to share, and then I want to, we’re actually going to tell you our process, our playful creative process about how we do this, is that when you’re looking at the promotional calendar, don’t forget this is all about connecting with people and making a difference in people’s lives. I think one of the places where people feel so offended by marketing, and it makes us reluctant to do our own marketing, is that it is always about the sale as opposed to about the people, and so when you’re looking at your promotional calendar, always look at each promotion from the perspective of who is this promotion for, and what problem is it solving for them? Because when you know that you’re growing your business to both help people and make money, it changes the emotion and intentionality that we have behind it and allows us to approach all of our promotions from really from a place of grace. That word keeps coming up. I didn’t realize we’d written it here in December when we were doing our planning for this, but one of the words that’s on our hearts and in our minds this year is “grace.” Right? How can we bring more grace and ease to everything that we’re doing? Planning is the number one way to do that. Right? Sitting quietly in meditation is a different way to do it, but planning allows the spaciousness, and it allows you to really connect your planning and your promotions to the people that are on the receiving end of that. Brad Dobson: Yeah. Yeah, and just remember that these promotions, this marketing, these sales, are to help your ideal client. You’re trying to help people, and this is the best way that you can do that. If you’re not putting your stuff out there, whether it’s stuff in an Etsy store or coaching, if you’re not putting it out there, how are you going to help your peeps? You got to do it. It’s important. Minette Riordan: … but how can you look at things in 90-day chunks in order to make everything go faster? Because we all want to make a profit in our business. We all want to get that money flowing in, and we need to be really careful that in our urgency to create income, we’re not also creating burnout and overwhelm. The first thing that we do is, we literally start with a giant, 12-month wall calendar, or just a big sheet of paper with the 12 months written on it. On that wall calendar, you want to mark holidays first. This was something that I learned also the hard way. I’ve learned a lot of things in business the hard way, but I owned a publishing company. I had a parenting magazine for 11 years, and holidays were super important. Right? We did a lot of work with the holidays, and so the first thing to do is to get a 12-month calendar and mark all the important national, political, religious holidays. Right? Hanukkah, Christmas, Kwanzaa. Minette Riordan: Thanksgiving, Valentine’s Day, Grandparents Day. Brad Dobson: Yeah, we talked about that. Minette Riordan: We’ll put a link in there to some of the lists of all the quirky holidays. You might list some of the quirky holidays that would be fun, playful, and of interest to your ideal clients. Then, using sticky notes is my favorite process to do this, but if you’re using a wipe-off calendar, you could also use just a whiteboard marker, but I love using sticky notes to start to plan your promotions. Kind of just do a brain dump on the sticky notes of the different things that you want to be promoting for this year and start to place them on the calendar. Sticky notes are great, because they allow you to move them around, or one of my clients told me about these new things called slickies, as opposed to sticky notes. Brad Dobson: I don’t want to know. Brad Dobson: Yeah, and for folks that are listening to this time delayed, you don’t have to do this in January. You can do this any time. Start right now. Brad Dobson: … definitely want an initial first pass of 12 months, and then you can start to plan things away from that. I think the only other thing I would finish up with is that part of this is really fun for us, because what it does is, it allows us to plan creative things, things that we’re going to create, to promote, and that can be really fun. Minette Riordan: It can make us get a little too creative as well, so we actually have been really good, I would say, in the last 60 days. We’ve been looking at what can we let go of in our business. Brad Dobson: Right. Yeah, but I know that there’s people out there that are listening that they think, “Hey, oh, I got this great idea for a new T-shirt, a new product, a new coaching program,” whatever it is. Yeah, this is the fun time that you get to put together how you’re going to promote that and what it is you’re going to create for the next year or the next quarter. Cool stuff. Minette Riordan: We have a couple of gifts for you guys. If you go check out the show notes at the pathtoprofitacademy.com and just click on the “Podcast” button right at the top, it will get you directly to the show notes for this episode. We’re going to put a picture of our wall calendar in there so you can see some of our planning that we’re doing, but also I have a fun 12-month promotional calendar printable template with instructions that I just shared very briefly with you with some more detailed instructions about how to create your promotional calendar, all lined out for you. If you know this is something that you need to do and you love free, downloadable printables that are colorful, and bright, and pretty, go check out our show notes at pathtoprofitacademy.com and click on the “Podcast” button at the top of the page. Brad Dobson: Cool stuff. I’m Brad Dobson. This is my lovely 33-year-old wife, again, this year. Minette Riordan: 53 and proud of it. Brad Dobson: … we will see you again next week. Minette Riordan: On Episode number 80. Wow! Brad Dobson: Thanks for listening.